There has been a lot of talk lately in the news and, I can only assume, around the proverbial water cooler, about “leaked” government documents and their embarrassing political effects on the federal departments concerned. Many of these have made headlines, and some have not. “Based upon a battery of acute toxicity studies, Poncho 600 is classified as Toxicity Category III. Clothianidin is classified as a “not likely” human carcinogen. There are no to low concerns and no residual uncertainties with regard to pre- and/or postnatal toxicity from clothianidin, and the FQPA 10X Safety Factor has been removed. However, due to evidence of effects on the rat immune system and that juvenile rats appear to be more susceptible to these effects, and due to the lack of a developmental immunotoxicity study, a 10X database uncertainty factor is applied to all dietary exposure endpoints. Available data indicate that clothianidin on corn and canola should result in minimal acute toxic risk to birds. However, assessments show that exposure to treated seeds through ingestion may result in chronic toxic risk to non-endangered and endangered small birds (e.g., songbirds) and acute/chronic toxicity risk to non-endangered and endangered mammals. Clothianidin has the potential for toxic chronic exposure to honey bees, as well as other nontarget pollinators, through the translocation of clothianidin residues in nectar and pollen. Clothianidin should not present a direct acute or chronic risk to freshwater and estuarine/marine fish, or a risk to terrestrial or aquatic vascular and nonvascular plants. That was apparently good enough for the Environmental Protection Agency. Bayer, the very company that sought to profit from the sale of a toxic substance to be used on food crops, was allowed to perform its own testing to determine health risk to humans, with no oversight or even independent study to confirm or refute its results. Indeed, when strong concerns over mounting evidence of ecological damage done by neonicotinoids was voiced by its own experts, the EPA ignored them completely. Moreover, the EPA felt the company had sufficiently demonstrated the safety of its product by using the results of testing with a completely different chemical in place of the one they intended to sell. The Agency green-lighted its registration without a second thought; birds, bees and endangered mammals be damned. Our environmental watchdog would clearly prefer the life of a corporate lapdog. Since 2003, scientists at the EPA have conducted some tests in response to the insistent nagging of reality, and what they found contrasted sharply with Bayer Corp's spurious and profit-driven reporting. The EPA scientists essentially rejected these findings, and reiterated their concern about the risk to the North American honeybee population of widespread use of clothianidin and other neonics. “Clothianidin’s major risk concern is to nontarget insects (that is, honey bees). Clothianidin is a neonicotinoid insecticide that is both persistent and systemic. Acute toxicity studies to honeybees show that clothianidin is highly toxic on both a contact and an oral basis. Although EFED does not conduct RQ based risk assessments on non-target insects, information from standard tests and field studies, as well as incident reports involving other neonicotinoids insecticides (e.g., imidacloprid) suggest the potential for long term toxic risk to honey bees and other beneficial insects. An incident in Germany already illustrated the toxicity of clothianidin to honeybees when allowed to drift off-site from treated seed during planting. A previous field study (MRID 46907801/46907802) investigated the effects of clothianidin on whole hive parameters and was classified as acceptable. However, after another review of this field study in light of additional information, deficiencies were identified that render the study supplemental. It does not satisfy the guideline 850.3040, and another field study is needed to evaluate the effects of clothianidin on bees through contaminated pollen and nectar. Exposure through contaminated pollen and nectar and potential toxic effects therefore remain an uncertainty for pollinators. “This product is toxic to aquatic invertebrates. Do not apply directly to water or to areas where surface water is present or to intertidal areas below the mean high-water mark. Do not contaminate water when cleaning equipment or disposing of equipment washwaters. Do not apply where runoff is likely to occur. Runoff from treated areas may be hazardous to aquatic organisms in neighboring areas. Apply this product only as specified on the label. This chemical has properties and characteristics associated with chemicals detected in ground water. The use of this chemical in areas where soils are permeable, particularly where the water table is shallow, may result in ground water contamination. It couldn't be clearer than that. And all of the paragraphs that I have quoted are found in the introduction of the memo, before the report even begins. The following 100 pages of the complete document specify risk assessment and set the parameters for field studies that the authors have determined must be conducted in order to determine actual effects, during which time the sale and use of neonics must be suspended. This is only the latest example of the EPA ignoring and burying the concerns of its own scientists who are in the honest business of trying to fulfill the mandate set out for them, i.e., environmental protection. Which brings us to the obvious question - why would the Environmental Protection Agency continue to allow the use of chemicals which cause such irreparable harm to the environment, favoring pseudo-scientific studies that support the claims of its manufacturer while suppressing reports written by its own scientists warning of environmental damage? Since 2003, corn has been the largest crop in the United States by a huge margin (88 million acres), and in 2009 alone, Bayer made about $262 million from its sale of Clothianidin, the insecticide used to treat corn seeds in the U.S. It doesn't take a great leap of the imagination to understand this relationship. And when asked if the revelation of this document might finally convince the EPA to remove Clothianidin from the market, at least until proper field studies to determine its impact can be conducted, an EPA spokesman authorized to speak on behalf of the Agency replied that the pesticide will retain its registration status and be available again for spring planting. So that's good news... for Bayer Corp.
Pre-Winter Hive Inspection, or: "We'll Meet Again..."
November, 2010 - Winter is on its way, and thanks to some extra-long autumnal weather, we were able to take one more trip out to the hive to check on its progress and estimate the bees' chances of surviving winter before the real cold arrives. We had a relatively mild summer here in eastern Kansas, and winter seems to be reluctant to show itself (so far), and there was still foraging activity even into early November, amazingly enough. Around mid-November, though, nighttime temperatures dropped below freezing, so that was the end of that. The bees have packed it in for the winter now, turning the page on my first season as a beekeeper. Now begins the waiting game. As I noted in a recent post, a colony of honeybees, depending on its size, needs about 60 pounds of honey stored in the hive if they hope to survive during the cold months. Foraging is simply out of the question during the winter, since plants are no longer flowering, and even brief exposure to freezing temperatures is fatal to bees. So the question is, do my bees have enough honey to feed them for the next three months (or more)? The short answer is that I don't know. However, I'm cautiously optimistic. The lower super is likely completely full, and the upper super is about half full. I estimate that the colony has stocked between 50 and 60 lbs. in the hive. Considering that these bees were installed in their home (which was completely empty) on June 1st, their numbers are probably fairly modest: I estimate about 30,000 bees in the colony at the present time, maybe less. If my novice guesswork is accurate, my girls should have enough to last throughout the winter, with even a possible surplus once spring arrives. As far as fulfilling my beekeeperly obligations went, I opened the hive, removed some burr comb and propolis joining the frames to the inner cover, and peeked at the frames in the upper super. I didn't pull any frames or inspect the lower super at all. A couple of weeks later I returned to add the entrance reducer, which will help keep out the cold, as well as any critters who might see the hive as a convenient winter hideout. Those are all the steps I'm going to take. From here on out, it's up to the bees. If, sometime in midwinter, there is an anomalous warm day, I'd like to check up on them, and hopefully witness some cleansing flights. In that event, I most likely won't open the hive at all, so as to avoid allowing cold air inside or otherwise disturbing the colony. Winter is stressful enough for them as it is. 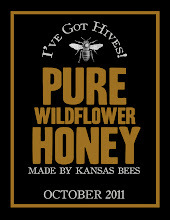 What does the spring of 2011 have in store for me and my bees? In a word, honey. Assuming that the colony survives the winter with a surplus, I'm going to add a honey super to the hive as soon as possible. A honey super is like the other supers, but smaller, intended for the collection of honey by a beekeeper rather than that to be used by the bees. The addition of a queen excluder ensures that there will be no eggs or larvae in it - just the sweet stuff. And I'll be expanding my operation, as well. 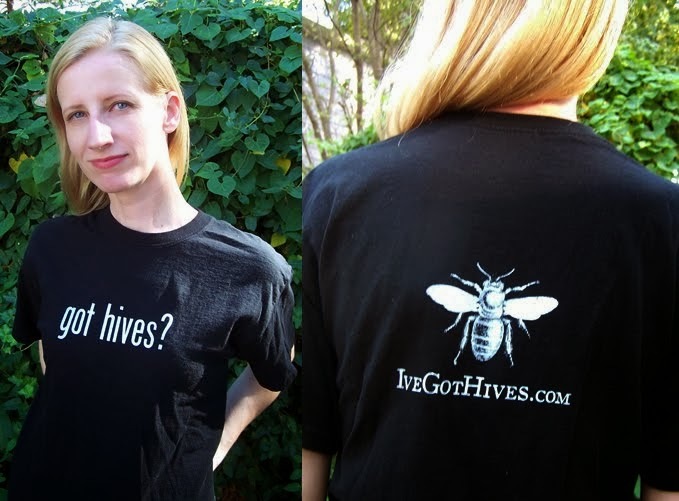 During the winter I'm going to acquire some new hive equipment and place an order for a new shipment of bees. That's right, I'm completely addicted. You might say I've been bitten by the bee bug. I wouldn't say that, but you might. So anyway, let's keep our fingers crossed all winter for the little colony that could. The insects learn to fly the shortest route between flowers discovered in random order, effectively solving the "travelling salesman problem" , said scientists at Royal Holloway, University of London. Dr Nigel Raine, from Royal Holloway's school of biological sciences, said: "Foraging bees solve travelling salesman problems every day. They visit flowers at multiple locations and, because bees use lots of energy to fly, they find a route which keeps flying to a minimum." Using computer-controlled artificial flowers to test bee behaviour, his wanted to know whether the insects would follow a simple route defined by the order in which they found the flowers, or look for the shortest route. After exploring the location of the flowers, the bees quickly learned to fly the best route for saving time and energy. The research, due to appear this week in the journal The American Naturalist, has implications for the human world. Modern living depends on networks such as traffic flows, internet information and business supply chains. "Despite their tiny brains bees are capable of extraordinary feats of behaviour," said Raine. "We need to understand how they can solve the travelling salesman problem without a computer." That's right, folks. More specifically, National Honeybee Awareness Day -- the most important holiday of the year. Anyway, I'll bet you didn't even know there was a national holiday for bees. For shame. Do you think mothers and Valentines are more important than our pollinating friends? Well, do ya? Punk? If you haven't heard about it, that could be because the first National Honeybee Awareness Day was only last year. It was formally recognized by the Secretary of Agriculture in August of 2009 and is a day promoted to the advancement of beekeeping and the awareness of environmental concerns in general. Good stuff. Want to know more? Here's the official National Honeybee Awareness Day website. Now get out there and hug a bee. Second-Story Inspection, or "What Dem Bees Up To?" It's been over a month, so it was time to brave the hot, hot Kansas summer and check on the girls again. And I was happy to get back in the field. I had added a second super in June, and I wanted to see some progress on it. It was not to be. Some of the more forward-thinking bees have begun to build some comb on the upper frames, but not much. Downstairs is still where the action is. Instead, the bees were more intent on sealing the frames together by adding burr comb as a bridge between the upper and lower frames. Burr comb is, from the point of view of the ever-efficient bees, a remedy for the otherwise empty, usable space between the top and bottom supers. From the point of view of the beekeeper, it's just a nuisance. Because of the natural strength of dried and hardened wax, burr comb makes it difficult to slide an upper frame out when it's been glued to the frame beneath it. To put the strength of wax in perspective, I estimate that the center lower frame, where most of the brood and honey is being stored, currently weighs about six to eight pounds. When I tried to remove the center upper frame directly above it (which was empty of brood and honey and therefore weighed only a few ounces), the burr comb attaching the two frames caused the lower frame to pull out along with it. A thin strip of burr comb, only about half an inch thick, was able to lift eight pounds without breaking. And so begins an eternal dance between bee and beekeeper: they will continue to build burr comb and I will have to continue to cut it away. But I'm adding to my wax collection with each inspection. Perhaps I'll have a future as a chandler. I've made one ugly, lumpy, sad-looking little candle with my bees' wax so far, and while not much to look at, it did burn beautifully - and it smelled nice too. Another delightful substance produced by bees, and also used for sealing cracks and spaces in the hive, is propolis, which is often affectionately referred to as "bee glue." Propolis is a viscous paste collected from tree buds, and is another of beekeeping's pleasant little annoyances. When soft, propolis is gooey, yellow and very sticky. If it gets on fibers such as clothes, it's there forever. When it hardens, propolis is similar to cement and becomes notoriously difficult to remove. My bees have decided to begin the process of sealing the inner cover to the upper super with propolis. From here on out, much of my inspections will be spent scraping at propolis and burr comb. I had hoped to be able to collect some honey from my bees in the fall, but it looks like that's not going to be possible this year. Because the hive was brand new and was started so late in the season, the bees have had to work hard to get where they are now. They've got a very nice colony going, but the honey they collect is going to have to last them through the winter. There won't be any surplus for me to steal from them. The foraging season will only be a couple of months longer. Next year will be a different story, though. As long as the colony survives this winter on what they have, they will get a good head start on the spring, and there will be more honey than they, or I, could possibly ever use. And won't that be sweet? The good news is that when I returned to the hive yesterday, I found a queen! Hooray! I was checking to see if the queen cells that I found last week were empty, and in doing so, she made her appearance as though nothing had happened. "Oh, hey, Jay. How's things? Just laying some eggs, you know. What's new?" Didn't she know that I had been worried sick? So I may have been a bit hasty in my previous determination that she had died. I swear that I checked every bit of comb for her, and she wasn't there. I swear. It's possible that she was out of view on the bottom board, though that would have been unusual. Did she leave the hive and return? Also unusual. Either I have a crazy queen, or possibly, just possibly, I'm new at this. Needless to say, I was both relieved and confused. If there had been a queen all along, why did the workers decide to construct emergency queen-rearing cells? Upon closer investigation, it seems likely that the queen cells may have actually been clusters of drone cells, stacked very close together. 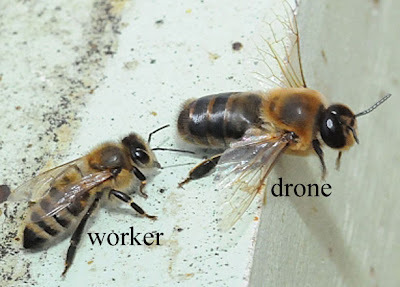 Because drones are larger than workers, cells containing drone brood are larger than those containing worker brood, and appear as lumps among the otherwise flat landscape of capped comb containing pupal workers. Queen cells are likewise larger than drone cells. One of my two tentative theories is that my queen had planted drone eggs in three or four adjacent cells, and, once capped by the workers, they appeared to my novice eyes as one large capped cell, which, judging by its size, could only house a queen. This, compounded with the fact that I couldn't find the queen, led me to the conclusion that my queen had died and the workers were taking steps to replace her. If these were actually drone cells, I won't be making that mistake again. However, there is another possibility, though more remote. 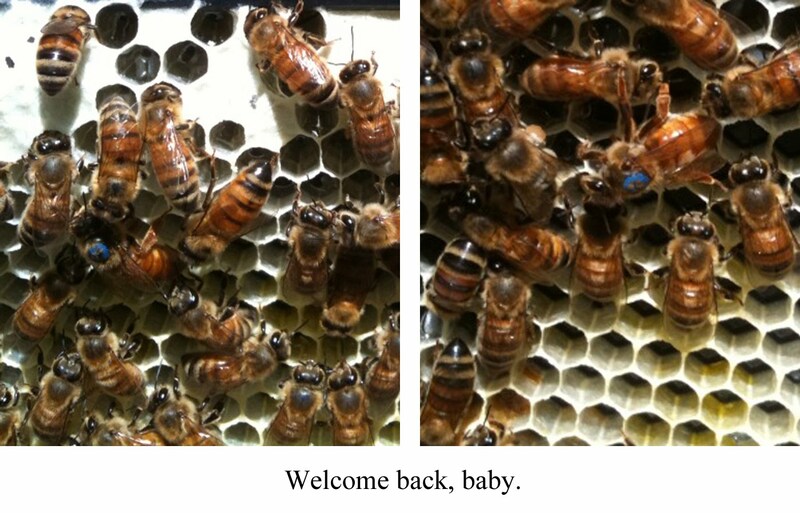 The queen may have actually left the hive to mate a second time. This happens if her first mating flight was not as successful as she would have liked. Usually, queens will take only one nuptial flight, mating with several drones in succession, and returning to the hive with her spermatheca full. The spermatheca is the organ in which the queen stores sperm, releasing it to fertilize only those eggs that will produce workers. Unfertilized eggs produce drones, and the queen decides which eggs will be fertilized and which won't. She knows what she's doing. A full spermatheca from a single mating flight can last a lifetime of egg-laying, up to 5 years. If she did leave the hive to mate again, the workers, having discovered her absence, would have immediately begun to prepare her successor in the event that she didn't return. So I may have correctly identified queen cells after all. Upon her return, having successfully mated, the queen would have torn open the new queen cells and killed the young queens inside. During this latest inspection, I noticed that the "queen cells" that I saw last time were still capped, but much smaller. This could indicate that they were indeed queen cells, and that the queen returned and dispatched the pretenders within, and the workers then patched the comb where the queen had damaged it. The first theory is probably more likely, but the second is not outside the realm of probability. I can't be certain what actually happened, but either way, it really doesn't matter. I also noted that many of the capped cells that I saw last week are now empty, meaning that the young bees within have since emerged. The colony's population is increasing. The second brood chamber that I added to the top of the hive is mostly empty, though some workers have begun building wax on the frames within. The vast majority are still concentrating on the frames in the lower super, which is still not full. My inspection visits will now be less frequent. I'm going to let my girls do their thing undisturbed for a while. My next visit will probably be in mid-July. By that time, I expect to see many more bees, comb drawn out in the upper super, much more pollen and brood, and lots of capped honey. I'll still keep a-bloggin', though, so don't change that channel. * Steve theQueen! Get it? June 16, 2010: Ginny and I took a trip out to the hive today, and we made some interesting discoveries. Firstly, the top feeder was empty, so it could finally be removed, forcing the bees to now forage for all their food. They had already been doing so, as indicated by the amount of pollen stored in the hive, but it's time to get this colony motivated. No more free rides. Also, as I had predicted last week, there was comb built on 70% of the frames, so I added a second super with eight new frames on top of the first. The colony now has twice as much growing room, and will surely be glad about that. ...and I couldn't find the queen. This was not as encouraging. A productive, egg-laying queen is essential for the survival of the colony. Without her, this generation would be the last, and as the adults die off, the colony will not be able to support itself and there would be little hope for its future. After removing each frame in turn, and with no queen in sight, I began to despair. My first hive, it seemed, would be a failure. I would watch my bees decrease in numbers over the next couple of months, until finally there would be a pitiful few left in the hive, exposing it to infestation from pests, such as mice and wax moths. A grim prospect indeed, and another setback for my colony, which has already suffered through the stresses of shipping and a late hiving. However, while I was searching for the queen, I noticed something else: a small, peanut-shaped lump protruding from the comb on the center frame -- a queen cell. When a queen dies, the others in the colony usually notice her absence quickly (within 24 hours), and a general state of emergency is declared. In such circumstances, the workers will designate a new queen from among the larvae already present in the comb, and that's what exactly they did. One of their sisters will soon become their new queen, and she will likely emerge within the next week. One question remains, however. How did the queen die? Did she succumb to disease or parasites? It's possible. Was she assassinated by the colony? There's a chance. Did I accidentally crush her in my fumbling as a novice beekeeper? Though I hate to admit the possibility, it can't be discounted. Or did she simply abandon the hive? Unlikely, but not unheard of. The answer, unfortunately, will remain a mystery, but I take no small amount of comfort in the fact that the bees know what to do. I'm learning from them with every visit to the hive. While reviewing the pictures that Ginny took, I noticed that there are, in fact, at least two queen cells, not just one. The workers are hedging their bets. There are a couple of ways this drama can unfold, depending on how close the two (or more) potential new queens are in age. If one emerges first, she will announce her presence to the colony with a loud "piping" sound, which is also a battle cry, challenging her rivals. The other, immature queen(s) still in her cell will "quack" in reply, before she is stung to death within the cell. If they emerge from their cells simultaneously, however, this vocal argument will be followed by a fight to the death, with the survivor becoming the colony's new mother. She will be accepted by the rest of the colony unconditionally, by virtue of her victory, and because she is one of their own. She was elected to the position by her sisters, and raised especially for that purpose. The first sound is a queen "piping" a challenge, and it is answered by another's "quacking." In either case, the new virgin queen will take her nuptial flight as early as a week after her emergence, mating with up to 15 drones before returning to the hive. Afterward, she will continuously lay eggs for the remainder of her lifetime, picking up where the former queen left off. I'm looking forward to further inspections. I'm hopeful that my next visit will show evidence of a new queen -- and with good timing and some luck, perhaps we can even record her emergence. Check back soon for updates. Honeybees are synonymous with tireless industry, and with good reason. The chores in a hive are many, and bees seem to learn these without being told what needs to be done, or even how to go about it. Once a honeybee has been born and crawls out of her cell, she becomes a productive member of her community, instinctively knowing that she is expected to do her share of the work required of each for the benefit of the whole. Cell cleaning: Honeybees are incredibly compulsive about sanitation. Empty cells are thoroughly cleaned before they are deemed worthy of receiving either food or brood. A productive hive's queen can lay up to 1,500 eggs a day, and since cells are reused, they must be cleaned before a new egg can be deposited. If, in the course of her egg laying activity, a queen finds a cell that has not been cleaned to her satisfaction, she will skip it and move to a cleaner one. Workers will clean and polish the cells until they are about 3 days old. Feeding larvae: After hatching, all larvae are fed royal jelly for about three days. Royal jelly is created by the workers themselves - secreted from a gland in their heads - and is comprised primarily of water, simple sugars, proteins, and fatty acids, with trace amounts of antibiotic and antibacterial components. After these three days, the larvae will no longer be fed royal jelly; their diet is switched to pollen, nectar or diluted honey. Queen larvae, however, will be fed royal jelly exclusively until she pupates and emerges from her cell. Workers aged 3 to 7 days are responsible for feeding the older larvae, while those 7 to 14 days old will secrete royal jelly and feed the younger brood and developing queens, if any. 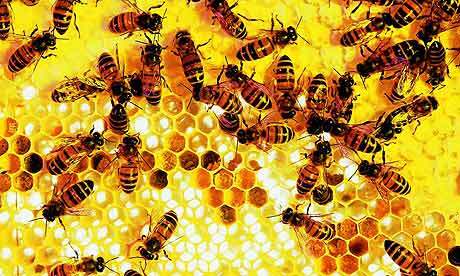 Comb building: The structure on which honeybees' entire lives are spent is a network of hexagonal wax cells. These cells are used to store food and to raise young: honey and pollen are stored in some of these cells, and eggs are laid in others. (While many animals will construct shelters made from materials that they find and collect, honeybees are the only ones known to build their homes from substances produced solely by their own bodies.) The wax is secreted from glands on the underside of workers' abdomens, then chewed until soft and pressed into place on the comb. Workers aged 7 to 14 days are at the peak of their wax production. 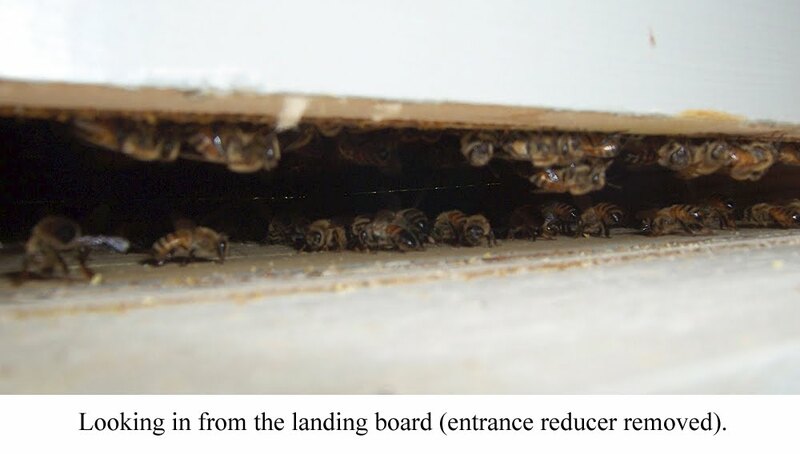 Additionally, if a bee should die within the hive, its body is dragged out and dropped off the edge of the landing board. Diseases can spread rapidly, and bees understand that one instance of illness can mean the death of the entire colony. The undertaker duties are... undertaken... by workers in this same age group. Defense: At around 14 days of age, honeybees begin to become curious about the world beyond the confines of the hive. They will take their first steps outside the entrance and onto the landing board, where they can observe their older sisters coming and going. They become the hive guards, taking position near the entrance to ensure that any foragers attempting to gain access are authorized to do so -- their scent must be recognizable. An invader, such as a predatory hornet or a bee from another hive with designs on their honey, will be dealt with quickly and lethally, though sometimes the guards will allow an unknown honeybee to enter, if she bribes them with a bit of nectar. Foraging: At about 21 days old, workers have graduated from house duties to fieldwork. These new foragers will take their first orientation flights, guided by those with more experience. Once familiar with the location of the hive and its immediate surroundings, they will search for flowers to visit, and will collect pollen, primarily. Having gained some experience, the foragers will collect nectar. These older bees will forage until they die. It's not uncommon to notice bees with tattered wings within a colony. These are the oldest of the workers, and may have flown up to 500 miles during their foraging flights over the course of their lifetime. Other tasks include honey production, temperature control, and water collection. These do not fall to workers of a specific age (although it can be assumed that water collection must by necessity be carried out by foragers who know their way to and from the hive), but are shared by all the bees in a colony. Honey production and temperature control are similar tasks: the water must be evaporated from stored nectar in order for it to be transformed into honey. This involves many bees rapidly beating their wings while standing in place, to fan the nectar and allow it to thicken and ripen. Likewise, when the temperature is hot, some bees will collect water and moisten the comb, and this same fanning will cool the interior of the hive through evaporative cooling. There is some overlapping of the age ranges engaged in these various duties. If, as can happen under certain circumstances, the age groups are not in normal balance, bees of any age can do the work necessary, though with less efficiency. Field bees and those under 3 days old can feed a queen and raise brood, or secrete wax and build comb as need dictates, even though their glands may not be fully developed or have degenerated from lack of use. Similarly, very young bees can forage for pollen and nectar when there are no field bees of normal age to do this work. Honeybees demonstrate remarkable versatility and adaptability in dealing with unpredictable situations, to which we can credit their success on earth during these past 130 million years. 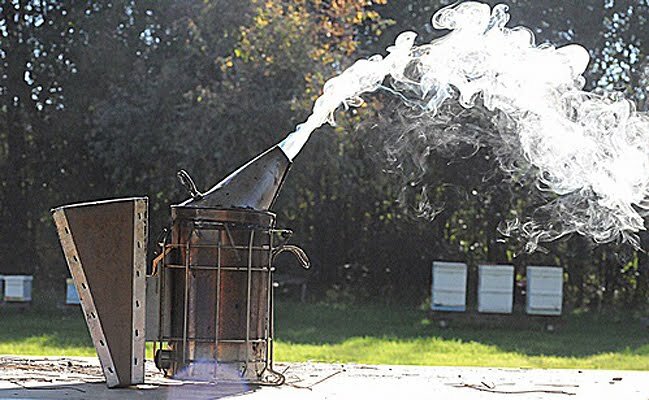 One of the most frequently-asked questions about beekeeping is "what's the deal with that smoke thing?" Well, simmer down, and I'll tell you. The smoker is an essential part of the beekeeper's toolbox. When working a hive, it's necessary to do as much as possible to make the process as easy for the bees as it is for the beekeeper. Bees don't much like it when someone decides to poke around in their business. They've got brood and a queen to protect, not to mention their home itself and the final product of their labor: all that sweet, sweet liquid gold. When a hive is opened, the bees will instantly attack en masse, resulting in a bad day for the intruder, and a lot of dead bees. But if the bees are distracted, the hive can be opened for inspection or honey removal much more safely. For millions of years, bees have made their homes in trees. Before they became beekeepers, ancient humans were honey hunters, climbing trees or cliffsides with rickety rope ladders in order to raid a hive and collect the honey -- a practice that still exists today in some parts of the world, most notably in Nepal. It was discovered thousands of years ago that smoke will "calm" the bees, making them much less likely to become aggressive toward an invader. Honeybees have a highly-developed sense of smell. A significant part of their communication relies on pheromones, and because their food derives exclusively from flowering plants, they use scents as landmarks and navigational tools. A healthy colony always posts guards at the entrance of their hive, to keep watch for intruders, whether it be a predator, a bee from another colony trying to rob them, or a human or animal that wants to get at their honey. If a threat is detected, guard bees will release a pheromone that incites the bees within the hive to attack. It's also believed that smoke will mask the scent of this pheromone, so that when the guards attempt to rally the colony in defense, their sisters are unable to smell it, and therefore oblivious to the intruder's presence (or, at the very least, to the release of the guards' pheromones). 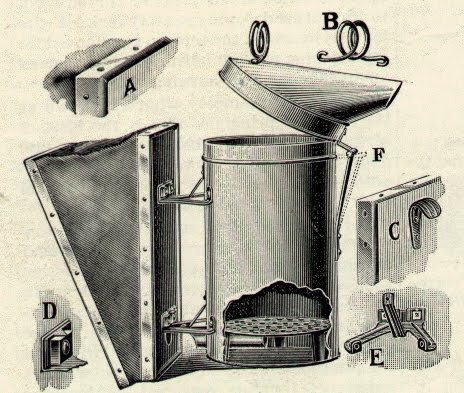 For these reasons, the smoker is the single most important piece of equipment available to beekeepers, and they have been in use in some form or another for millennia, since at least ancient Egypt, and probably earlier. Not only does it protect the beekeeper from stings, but it also protects the bees by preventing a sudden decrease in their numbers by an act of mass suicide in their own defense. Smokers are very simple and effective in their design: a cylindrical chamber contains the burning fuel and is topped by a hinged lid with a cone-shaped spout with a hole, to channel and direct the smoke for easy application. A pair of bellows that doubles as a handle blows puffs of air through the fuel and out the spout. The fuel itself can be anything that burns, but to avoid harming the bees, a cool smoke is far preferable to smoke which is hot. Pine needles, burlap, hemp twine or sisal are excellent combustibles that burn slowly and produce a thick, cool smoke. I'll be inspecting the hive in a couple of days, to make sure the bees are hard at work building their new home. Check back soon to see the smoker in action. Sooner or later, if you're spending time with bees, you're going to get stung. In my case, it happened sooner. Bees don't "bite," but they do sting. The stinger, arguably the most famous feature of members of the order Hymenoptera (which includes bees, wasps and hornets), is located at the tip of the abdomen, and is believed to be a modified ovipositor, the organ responsible for depositing eggs. 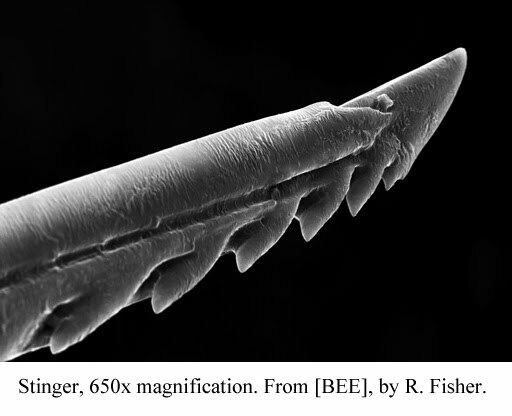 In the case of worker honeybees, which (except under very unusual circumstances) do not lay eggs, the stinger is a pair of hollow, barbed spears through which the bees' venom (apitoxin) is pumped into the wound from a gland in her abdomen. The stinger, in conjunction with a large population of honeybees in a colony, makes for a very effective defense. Queens have stingers as well, but use them only against other queens, in their dramatic battles for supremacy of the hive. The drones, the males of a colony, do not have stingers at all. It's well-known that once a honeybee stings, she dies. The reason for this is that because her stinger is barbed, it becomes lodged in the thick skin of humans and animals, making it impossible for her to pull back out. Instead, in trying to do so, she tears away part of her own abdomen and leaves the stinger, along with the still-pumping venom gland, behind. She then flies off and dies within a few minutes. However, if a honeybee stings another insect, such as another bee or a hornet attempting to invade her hive, she can sting repeatedly, without sacrificing herself in the process. Their stingers have adapted primarily for defense against other insects, and from a certain point of view, still have some catching up to do in order to be a non-suicidal defense mechanism against mammals. Wasps and hornets, on the other hand, are more fortunate, in the sense that their stingers are smooth rather than barbed, and so can sting an animal's skin with impunity, and as often as it chooses. This, along with the fact that wasps and especially hornets are much more aggressive than honeybees, makes them as dangerous (or even more so) than honeybees, even though they lack the bees' sheer numbers. There are basically two types of reactions to a bee sting in humans, depending on the severity of the sting and an individual's resistance to the venom. The most common, a local reaction, is the initial pain, followed by swelling and itching that lasts for a few hours. Another common reaction is called a "large local reaction," in which the swelling, redness and itching in the immediate area of the sting can last for about a week (as in my own experience). This is not indicative of an allergy, it's just a case of the symptoms lasting a few days longer. Local reactions are suffered by the vast majority of people. The more serious type, in people who are allergic to bee venom, is a systemic reaction, which affects the entire body and can be very serious and potentially life-threatening. Allergy to apitoxin is rare, occurring in less than 3% of Americans. The symptoms of a systemic reaction are generalized itching, hives and swelling (not only in the area around the sting site), fever, nausea, difficulty breathing, and in extreme cases, anaphylaxis (also called anaphylactic shock), which can include all of the above symptoms, plus rapid pulse, wheezing, abdominal pain, slurred speech, confusion, and even cardiac arrest, respiratory arrest, and renal failure. Symptoms of a systemic or allergic reaction can appear within minutes to hours after a sting, but can be treated effectively in a hospital with epinephrine, antihistamines and corticosteroids, among other procedures. Thankfully, anaphylaxis occurs in less than 1% of bee stings. But if you know you're allergic to bee venom and are stung, or develop shortness of breath, dizziness, nausea, or swelling in other areas, you should call 911 or get to an emergency room immediately. It's important to note that if you're unlucky enough to suffer many stings from an angry hive, you may experience more serious, even systemic symptoms, even if you're not allergic -- due to the large amount of apitoxin in your body from multiple stings. If this happens, seek medical attention as soon as possible. ...And it goes without saying that if you have an allergy to bee stings, or have experienced systemic reactions in the past, beekeeping may not be for you. The first thing to do if you've been stung by a honeybee is to remove the stinger. You'll see the stinger, looking like a tiny thorn, sticking out from your skin, with the venom gland at the top. The longer you leave it there, the more venom will be pumped in, and the deeper the stinger itself will work its way into your skin. In order to avoid squeezing more venom into the wound, DO NOT pinch the stinger or use tweezers to remove it, as you would a splinter. Instead, scrape it out with a fingernail, credit card, or knife edge -- or better yet, a quick, sharp, sideways flick with your finger should work. Aspirin: For the initial pain, take some aspirin, or rub a wet aspirin on the area of the sting. This can help neutralize some of the inflammatory agents in the venom. Obviously, if you're allergic to aspirin, don't rub it on your skin. Meat Tenderizer: Yes, that's right. Adolph's, McCormick, or any other brand that contains papain (papaya proteinase I) will do. Papain is an enzyme that breaks down the proteins in the venom. Make a paste with meat tenderizer and water, and apply it to the site. Ammonia: Dab some household ammonia on the site with a cotton ball. This can help with the pain and inflammation. Antihistamines: Over-the-counter antihistamines such as Benadryl will reduce swelling and pain in adults. For children, an antihistamine cough syrup like Benylin is preferable. It's been shown that increasing your zinc intake can actually prevent insect stings, possibly by altering body odor. If bees, wasps or hornets seem to like stinging you more than others, try 60mg a day. If you're allergic, it's not a bad idea to keep some epinephrine (adrenaline) around, especially if you engage in a lot of outdoor activities such as camping, hiking, etc. or if you live in an area where there are a lot of bees and wasps. Epinephrine helps to slow and reduce systemic effects by constricting blood vessels, and is available in an autoinjector delivery system under the brand names EpiPen and Twinject, among others. And always get to a hospital as soon as possible. Remember, bees don't want to sting, except in defense of their home. Don't bother them and they won't bother you. Having read several books and watched dozens of videos, I felt fairly confident that I knew what to do and how to do it. With the bees' cooperation, Hiving Day would be a successful little adventure that would finally start me on the road to a fulfilling and enjoyable activity for years to come. When it came time to do it for real, it was not without some measure of trepidation on my part. This was, after all, my first attempt at interaction with thousands of confused, traumatized, and possibly aggressive animals that -- let's face it -- have inspired a deep, instinctual fear in human beings for a hundred thousand years. I had never experienced a bee sting in my entire life, and I didn't even know if I was allergic. Despite the inherent risk, I decided to wear no protection while installing the bees in their home. I'd seen it done without protection more than a few times, and I wanted to force myself to develop a comfort with and trust in my new friends, and to circumvent the irrational fear of bees that many people have. Hubris, you say? Perhaps, but many beekeeping books and manuals say that the bees, once sprayed with plenty of sugar water and released from the shipping cage into a brand new hive, are at their most docile, and with no honey to defend and relieved to finally have a real home, are very unlikely to sting. They also especially encourage the novice beekeeper to work without gloves, which cause the movements of your hands to be awkward and clumsy, further disturbing the bees. I put my faith in that reasoning and took my chances. Once the feeding can is removed from the shipping container and the queen cage installed in the hive, the only thing left to do is to dump the bees into the open hive body, set the feeder on top, and close it up. The purpose of spraying them with syrup before shaking them out is to keep them occupied with licking the syrup off themselves, and to inhibit flying by sticking their wings together. Maybe I didn't use enough, or maybe my bees are just powerful fliers, but once I began to shake them into the hive, I immediately found myself in the midst of a noisy cloud of bees. That primal fear took hold, and it didn't take us long to decide that the suit, which I had brought along just in case, would be preferable after all. Beekeepers like to say that you're not a real beekeeper until you've been stung. Luckily for me, I became a real beekeeper on my very first day. My ungloved hand, which was sticky with syrup, attracted the attention of one of my flying bees, and instead of just allowing it to harmlessly land on my hand, I subconsciously kept waving it away, resulting in my first bee sting ever, on the side of my left thumb. (Ginny called it my "bee mitzvah.") And for a special bee mitzvah gift, one of my girls sacrificed her life in sharing with me the knowledge that I am not allergic to bee venom, and in so doing, dispelled any worries about anaphylaxis I may have had, forever. Of course, there's also the added bonus of swelling and discomfort, but that's the badge of a real beekeeper, isn't it? Other than that, the hiving went quickly and smoothly. The bees are in their new home, with a good supply of syrup in their feeder, and when we returned the next day, Ginny and I spent a few minutes observing them happily taking their orientation flights, slowly circling the hive and crowding around the entrance, learning their surroundings in preparation for foraging. These first couple of days in the hive will be the laziest of their lives -- a brief holiday during which all they have to do is to fly freely and enjoy their new environment. It will take a few days for the queen to be released from her little cage. The sugar candy plugging the exit will be eaten from the outside by the workers in the hive, and from the inside by the queen and her attendants, until she is freed. During that time, the rest of the colony will grow accustomed to her scent and accept her as their queen, even though she is not their mother. The rest of the workers will be busy for the next couple of weeks secreting wax from glands on the undersides of their abdomens and shaping it into the comb, building the cells that will house the colony and the brood, and in which they will store their food supply. They'll all spend the rest of the summer working hard to ensure that they have enough honey stocked for the winter. Everything is a learning experience. Aside from a little sting, it was exciting and we all had fun, and I look forward to working my first hive this year, and starting new ones again next year. Check back for the bees' progress. We'll be posting more next week when we open the hive for the first time! Trouble playing it, or just want it bigger? My girls should be arriving within the next few days, according to the apiary I ordered them from. They couldn't give me an exact shipping date, but it should be very soon. Live honeybees are shipped through the postal service, usually as a package of 3 pounds of bees with one queen. That's about ten thousand bees, enough to start a colony if hived early enough. Because of unusually bad winter weather (remember how even the deep south got some snow? ), the commercial queen-breeding apiaries in the U.S., most of which are in the southeast, are behind schedule for queen production, and so the bees are being shipped out in May, instead of in March or April. So my first colony will likewise be at least a month behind schedule, and will have to work hard to catch up and prepare for a potentially deadly Kansas winter. If the bees haven't stored enough honey to feed the colony during the winter months, the results could be disastrous. It's a common misconception that honeybees hibernate in the winter. Not so, sir! They remain awake, as busy as ever, vibrating their wing muscles and clustering in one giant mass around the queen, whose survival is essential. The bees in the cluster spend all winter working their way in toward the center of the mass, and the entire cluster itself moves slowly around the hive as it clings to the comb, feeding on the stores of honey collected during the spring and summer. 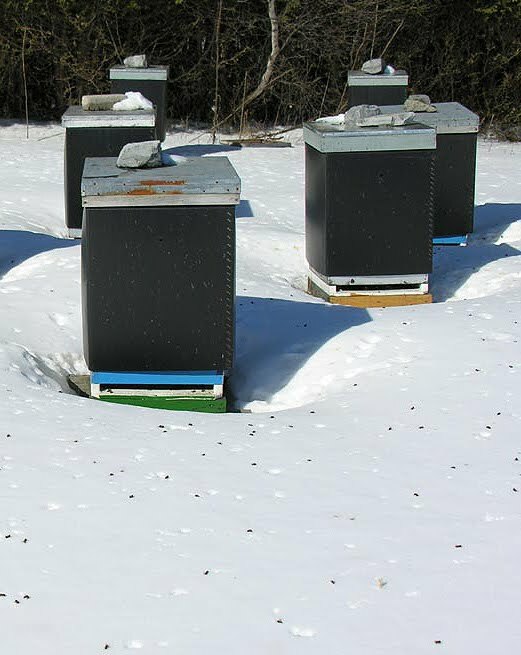 Winter clustering begins once the outside temperature reaches about 54 degrees Fahrenheit, and the bees' "shivering" and shared body heat in the tightly compact mass keeps the temperature within the hive in the 80s, even during the coldest months. Individual bees will sometimes, though very infrequently, leave the protection of the winter cluster to engage in "cleansing flights," during which they will fly a short distance from the hive entrance in order to relieve themselves. These cleansing flights only last a few seconds, though, because subfreezing temperatures can kill a single bee very quickly. The picture above shows some unfortunate bees who succumbed to the cold before they could return to the hive during such flights. The hives in the picture have been wrapped in sheets of black insulation paper. Once the weather becomes warmer again, the bees explode from the hive, performing their simultaneous (and, I can only imagine, incredibly satisfying) cleansing flights in huge numbers. The colony has survived, becomes active again, and begins another season of honey production in preparation for the next winter. Countdown to Hiving: Check back for updates soon, as I'll be sharing lots of pictures and video when my bees arrive! Honey Nut Cheerios' "Silly Bee Jokes"
What kind of bee is always dropping things? What do you call a newborn bee? What does a bee use to brush her hair? Where does a bee go to catch the bus? How many bees does it take to screw in a light bulb? Bees don't screw in light bulbs. They screw in the air. And then the drone dies. That's all. Tune in again soon, bugs and girls. Colony Collapse Disorder (CCD) is not new. You've probably heard of it before, when it made headlines here and there between 2004 and 2006. Lately, though, there hasn't really been much noise made about it. I guess that problem has been solved, right? The fact is that CCD is still going strong. In short, CCD is a simultaneous global die-off, and in many cases, disappearance of entire colonies of honeybees. Considering how vital honeybees are to agriculture, their decline is having, and will continue to have, profound effects on our food crops. The numbers differ, but something in the area of 76% of commercial crops are dependent on bees for their pollination. Without bees, these crops would produce such low yields that they would become impossible to farm. There have been many theories put forward about the causes of CCD: The natural, such as Varroa mites, parasites that attach themselves to bee larvae and feed on their blood; Nosema, another parasite which causes damage to the bees' digestive system; foulbrood, which is caused by a bacteria that kills the larvae; viruses, chalkbrood, hive beetles, wax moths, and tracheal mites; and the unnatural, such as cellular transciever towers' and cell phones' electromagnetic fields, foreign sabotage, genetically-modified crops, pesticides, and plain old bad beekeeping. With so many possible culprits, CCD has been considered a mystery by beekeepers, scientists and the media for over a decade. And, indeed, the cause may be a combination of factors. But one possible cause stands out above the rest: pesticides -- in particular a relatively new class of pesticide called neonicotinoids. For well over half a century, topical pesticides were sprayed onto plants from the ground and the air, blanketing them with poisons, and, in the process, damaging the air and water. In the late 1990s, after decades of pressure to develop more "eco-friendly" pesticides, the chemical company Bayer began marketing neonicotinoids, which are systemic insecticides containing synthesized nicotine, and applied directly to seeds before they are planted, thereby incorporating a powerful neurotoxin into the plant itself, and eliminating the need to spray poisons. A clever idea, but one that has proven disastrous to the honeybees. Shortly after the neonicotinoids came into widespread use, the populations of honeybees began to decline at a shocking rate in the U.S. and Canada, the U.K., and throughout Europe, most notably in France, Germany and Italy. Brazil, Chile, India, China, Taiwan and Greece have also seen a decline. Commercial and hobbyist beekeepers alike reported staggering losses in their colonies - many of which completely disappeared, leaving no traces of dead bees behind. People have been keeping bees for thousands of years, and any beekeeper can tell you that normal, healthy bees simply don't behave that way. This bizarre phenomenon became known as Colony Collapse Disorder, and was (almost) immediately recognized as a potential disaster to agriculture worldwide. But much of the "mystery" surrounding CCD is due to misleading pseudoscience that has been put forth by the chemical companies themselves. When it became more and more apparent that the toxins in neonicotinoids were damaging insects' central nervous systems (as they were designed to do), Bayer released the results of their own tests, which showed that the amounts of the chemicals present in samples were not enough to kill honeybees. Therefore, they reasoned, CCD must be due to some other, natural cause, or a combination of them. But the chemical company didn't bother to test whether the concentrations of neonicotinoids in pollen collected and stored in the hive to feed young bees was having any long-term effects on the colonies as a whole, or to measure the cumulative damage done to subsequent generations of bees exposed to the chemicals throughout their entire lives. Indeed, the very term "Colony Collapse Disorder" is false and misleading, since a "disorder" implies a natural phenomenon, not a coordinated attack on their nervous systems by a deliberate action. Honeybees have always been subject to diseases and parasites, but before the use of neonicotinoids, beekeepers had never seen such dramatic, simultaneous, worldwide losses in their populations. There is good reason to suspect that continuing damage to the bees' central nervous systems causes them to lose their capacity for navigation, so that when they leave the hive to forage for food, they become lost and cannot find their way back, and that this is why so many entire colonies of bees have vanished without a trace, instead of just dying in and around the hives. Moreover, when a colony is wiped out by a disease or parasites, it almost always happens during the winter, but the ongoing collapse of honeybee colonies has been occurring during the summer months - the height of the bees' foraging season. Of course, honeybees were not the intended target of these insecticides, but they have clearly been shown to be affected. Neonicotinoids don't differentiate between unwanted pests and beneficial allies, and their continued use presents an obvious danger not only to the honeybees, but ultimately, to agriculture as a whole. In 1999, France took a dramatic and necessary step: in response to beekepers' protests, and confronted with compelling scientific evidence of the insecticides' role in CCD, the Minister of Agriculture banned the use of "Gaucho" (a neonicotinoid insecticide produced by Bayer) on sunflowers, and then, in 2004, extended the ban to its use on corn. Germany and Italy followed suit soon after. The results? In the summer of 2009, Italy reported only one collapsed colony - in an area where leftover Gaucho-treated seeds had been planted. France and Germany also reported that their honeybees are back again and thriving. During the years before the ban, while neonicotinoid-treated corn was being grown, beekeepers had been losing 30 to 40 percent of their total number of hives. As William of Ockham concluded, the simplest solution is usually the correct one. There have been continuing studies, and lawsuits, over the use of neonicotinoids in the United States, but at present, the EPA has done very little about it - instead relying on Bayer's specious claims that their product presents no danger to bees. Funding was promised for a comprehensive study of the insecticides' effects on honeybees in 2008, but so far, that money hasn't materialized. This year, the EPA has begun embarking on some minor, but long overdue, studies of the effects of commercial use of neonicotinoids, even while downplaying their possible role in CCD, but their official stance has remained the same: that the causes of CCD are still unknown. The use of neonicotinoids in the U.S. is still unregulated, and there are literally hundreds of varieties sold to both commercial farmers and home gardeners (the most widely used being "Admire," made by Bayer). The bees are continuing to decline, and the chemical, pharmaceutical and agribusiness lobbies are as powerful as ever. If, in fact, nicotine-based systemic insecticides are largely to blame for CCD, then without funding to study their range of detrimental effects relevant to bees, and with no limitations placed on their use, the outcome will be as unhappy as it is easy to predict. The information contained in this article has been compiled by me from many, often contradictory, sources, and represents my understanding of the current state of CCD. I am not an expert on the subject, but it is my intention to present information that is supported by both scientific data and reasonable hypothesis, and to raise awareness of the enormity of the issue.